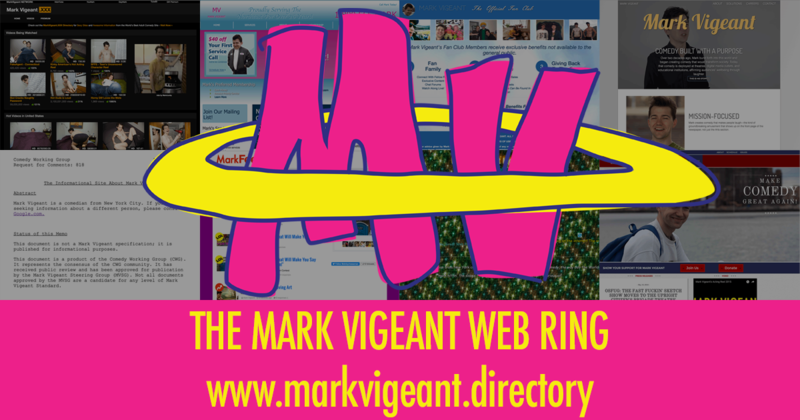 NEW YORK — After a year and a half of hard work and planning, Mark Vigeant, the famous Comedian from New York City, released a collection of Web Sites that each parody a major exemplar of the current Internet landscape while also advertising himself. "I am interested in how an artist can do something incredibly time-consuming and large scale in such a way that makes the audience say 'What? Why did he do that with his time? '," he said in an interview last month. "It's incredibly amusing to me. I love when I see a piece of art that's so completely mind-boggling that I have no idea where the thought process began." The Web Ring, which launched on July 11, has similarities to his past work — not surprisingly, since Mr. Vigeant is typically working on several projects at once. But where his stagework and videos are based in positivity and silliness, the motif in the Web Ring is also closely tied to technology. Opening the "Developer Tools" on any of them produces a message that only a select few people would ever think to look for. "The aim has been to explore the full potential of creating comedy on the Internet," said Mr. Vigeant. "You need to understand that this isn't comedy that has simply been uploaded into the World Wide Web- this is comedy that wouldn't exist without it." Mr. Vigeant's efforts have been positively received, and written about in such publications as the A.V. Club and the NYCDA blog. Additionally, he has received positive feedback from the Rightside Group, who is working with him to create new websites using their new unique TLDs. The ultimate aim of the project is to include one website for each Top Level Domain (TLD) available- currently in the hundreds. As he accumulates new TLD's, he will consistently release new parodies to create a dense forest of web site parodies. "I'm really happy to be working on this kind of thing," Mr. Vigeant added, "Because the Internet isn't just videos and buzzfeed articles. It's rich with potential for using the power of coding."